Rabbit is a favorite game meat for many people. 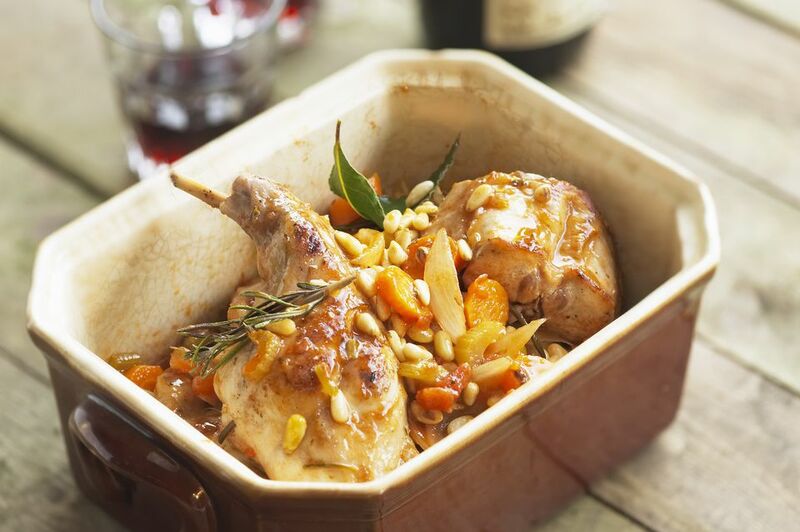 Not only does its delicate flavor pair well with fruits and sauces, but rabbit is also one of the healthiest meats you can eat. Home cooks are rediscovering rabbit as a delicious alternative to commodity meats. However, it hasn't quite hit the supermarkets yet, so you'll need to order rabbit from a butcher or online. For the latter, these stores are among the best. Family-owned Marx Foods has some of the finest rabbits you can buy. Their meaty rabbits are beautifully processed as striploins, saddles, chops, ground, and more. Marx Foods has an impressive inventory of all meats, poultry, and organic vegetables. Since they primarily sell to fine restaurants, you can only buy rabbit from Marx Foods in bulk. Nicky USA, located in Portland, Oregon, specializes in meats and game meats farmed in the Pacific Northwest. Its subsidiary, Nicky Farms, is family-owned and very involved in the meat processing. They are particularly concerned with ensuring their sustainable farms practice humane and responsible animal husbandry. Nicky Farms offers a wide array of high-quality meats and game meats. Their whole fryer rabbits weigh between 2-1/2 and 3 pounds. There may be other rabbit offerings at times, and everything is at reasonable prices. Prairie Harvest is located in Spearfish, South Dakota. It is a specialty meats company that prides itself not only on the high quality of their products but also on their superior butchering. Prairie Harvest primarily serves high-end restaurants but will also sell to the general public. The game meats are sourced from a variety of local farms and the rabbits come from Iowa. As with other online meat sources, their products are shipped in dry ice for a two-day delivery. Prairie Harvest has excellent products for individuals, but pricing is better for professional chefs. D'Artagnan, based in New York City, is famous for their excellent foie gras. They also have a wide selection of game meats. D'Artagnan sources humanely-raised rabbits from a cooperative of local New York State farms. They offer whole fryers, boneless loins, legs, saddles, and an intriguing rabbit and ginger sausage. You can even order wild Scottish hare. There's little doubt that D'Artagnan's quality is superb, but they are definitely high-priced. Igourmet.com began in 1997 as an online resource for cheeses and fine foods. It has since expanded to include meats, poultry, and game meats. The website is very user-friendly, and within each category, there are recipes for the products offered. The selection for game meats isn't as extensive as other websites but what they do have is excellent quality. Their Midwest-raised rabbits are available in 2 1/2-pound whole fryers, loins, hindquarters, and sausages. Since Igourmet.com offers so many products, they're definitely worth a look.